Queen of the "alphabet mysteries," novelist Sue Grafton takes us on a sunny afternoon tour of the Southern California town where she lives and where she brought heroine Kinsey Millhone to life. The great swath of Highway 101 cuts through the majestic nighttime setting of Santa Barbara - The last city in California to remove traffic lights from the major highway and construct an overpass. Here the coast makes its east-west turn and won't be north-south again until Point Conception, almost 40 miles away. When the Shoreline Beach Café's hot crab cakes and grilled-chicken burritos arrive at our table, lunchtime talk with mystery writer Sue Grafton turns to murder. Here in Santa Barbara, 95 miles north of Los Angeles, we're surrounded by crime scenes and familiar settings for Grafton's fictional star detective and alter ego, Kinsey Millhone. On Rainbow Beach, an ethereal seascape of fine taupe sand and silver combers, a solitary guest searches for sand dollars. Deep in a forest, beside a dark pond, a hushed party of four watches as dozens of great and snowy egrets tend their nests in a willow-pond rookery. Nearby, a giant pile of oyster shells, called a midden, shows one fascinated couple just how well coastal Indians dined before the white man came. The word "unspoiled" is much misused, but here it truly resonates. "What people say to me all the time is, 'Don't change a thing,'" says innkeeper McIntyre. "I think we're unique on the Eastern Seaboard. There's not much else like us. People enjoy the simplicity of it. They check in here tense and world-weary, and by the time they leave I have to push them out the door." "Just over there, practically outside that door," Grafton nods toward Leadbetter Beach and responds to a question. So that's where Kinsey popped up and blasted Charlie Scorsoni to bits in "A" Is for Alibi. And we've just come from the harbor and its curving concrete breakwater, where she tried to save suicidal murderer Renata Huff in "J" Is for Judgment. In all the alphabet mysteries - 14 to date, with "0" Is For Outlaw due in bookstores this fall-Grafton uses the pseudonym Santa Teresa for Santa Barbara, playfully renaming the city's beaches, parks, and streets. Read enough Grafton, and you may be afraid to visit. "I am responsible for most of the homicides in town," she acknowledges, her eyes full of mischief. Grafton has lived in her Santa Teresa archetype since 1964, with a few subtractions: a Hollywood scriptwriting period; a stint in Columbus, Ohio, for husband Steven Humphrey's Ph.D. work; and ongoing retreats to her native Louisville, Kentucky. Kinsey herself is attached to the place "like a tetherball on a very short cord," she says in "N" Is for Noose - and for good reason. In a book or in person, Kinsey's hometown paints a glorious swath for the eye. Against a backdrop of the Santa Ynez Mountains, Santa Barbara's level downtown grid and gently climbing residential streets gleam with color. Red tile roofs accent the white adobe walls of shops, offices, and houses. Spring shows off with purple jacaranda, and bright yellow cassia carries on through summer. It's all "so lush and refined that it ruins you for anyplace else," Kinsey says in "B" Is for Burglar. 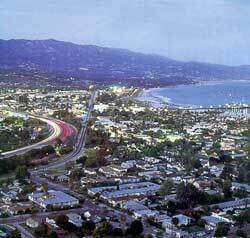 Grafton points out that Santa Barbara actually owes its captivating design to a devastating 1925 earthquake. The city was immediately but carefully reconstructed under strict requirements for architectural style, which drew on the area's rich Chumash Indian, Spanish, and Mexican history. "There's a sense of unity here," Grafton says. "Some people feel it's too controlled. But I think it's fabulous-it's what makes it a tourist attraction. I'd hate to go someplace that looks like 'ordinary-ville.'" Far from homogenized, Santa Barbara boasts a mix of 90,000 residents of diverse ethnic heritage and who range from university students to Hollywood moguls. Named for a saint by storm-tossed l7th-century Spaniards finding safety in its natural harbor, the city joins a stretch of coastline that runs east to west for some 40 miles. Such geography seems to move sunrise to the south and sunset to the north - a phenomenon Kinsey witnesses during daily jogs by the ocean. Paralleling the detective's running route, we drive with Grafton along Cabrillo Boulevard (Cabana Boulevard in the books), beside the year-round, seaside greenery of Chase Palm Park. Cruising downtown Santa Barbara, we stop by Kinsey's first office, at 903 State Street, in the thick of trendy shops. After a mishap in "H" Is for Homicide, she moved to 211 East Capillo Street (East Carrillo Street in reality). Several blocks away, on the corner of Milpas and Cota streets, the so-plain, so-popular Mexican restaurant La SuperRica often draws in Grafton and, whenever she's in town, Grafton's friend Julia Child, the culinary guru. Though Kinsey has not yet visited here, Grafton recommends the #15 - a cheese and bacon dish - saying matter-of-factly, "I order what Kinsey would want." In contrast to food-savvy Grafton, the anti-gourmet sleuth's favorite foods are fast, easy, and strange: Sizzling bologna fills Kinsey with longing, and she adores whole-wheat sandwiches of super-chunky peanut butter with crisp bread-and-butter pickles. When necessary, Kinsey dines at Emil's at the Beach. In real life, it's Emilio's Ristorante, on Cabrillo, where lobster and risotto become works of edible art - all lost on Kinsey. Twice divorced and free of children and pets, mid-30s Kinsey reveres her shipshape, converted-garage apartment. She blends into her modest neighborhood derived from the real Mason and Yanonali streets, near the beach. In contrast, Grafton, whose three children are grown, lives with husband Steven and cats Molly and Emma on a 4.5-acre estate in the exclusive enclave of Montecito (dubbed Montebello in the books). As personal chef Carol Bartoli prepares dinner, Grafton welcomes guests into her grand, two-story home with separate buildings for her immaculate office and personal gym. "I owe all of this to Kinsey," she says with genuine warmth and gratitude. 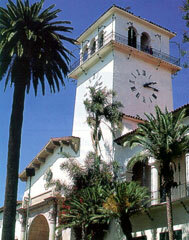 Near Grafton's house, Santa Barbara's venerable Four Seasons Biltmore commands 23 palmy acres above Butterfly Beach. Known to Kinsey as the Edgewater Hotel, this 1927 Spanish-Mediterranean jewel often figures in the sleuth's comings and goings. Pausing with Grafton in the lobby-where pressed, white, pleated gabardine trousers would seem in order-it's easy to think the next tap of shoes across the terracotta floor, dappled with Oriental carpets, might just be Kinsey trotting by in jeans and boots.